Thank you for being alongside us throughout 2013! 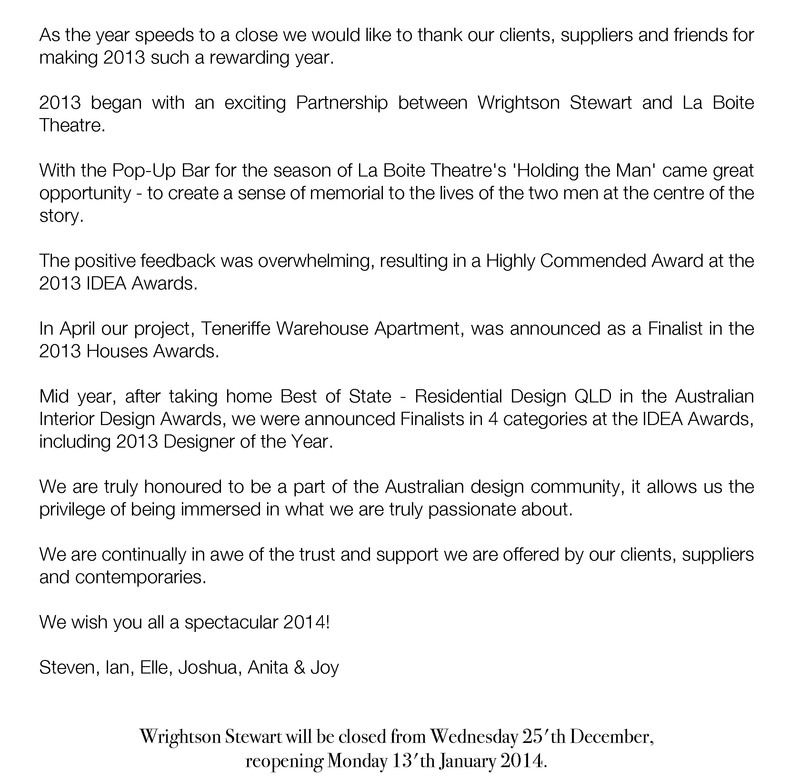 Wrightson Stewart will be closed for the Holidays from 25’th January, returning for 2014 on Monday 13’th January. Please follow us on Instagram! Box Magazine features The Teneriffe Warehouse! This weekend our work with the Jan Manton Art Gallery was featured in the Courier Mail, QWeekend edition. Enjoy! 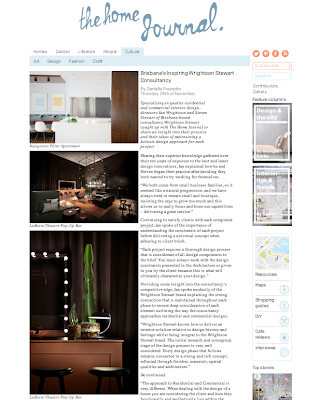 Our Teneriffe Warehouse has been featured by Fisher & Paykel! 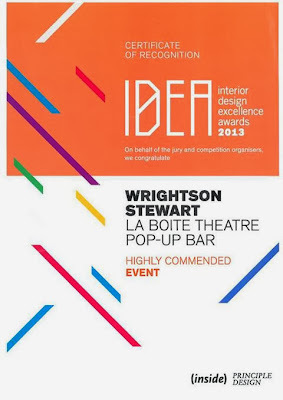 Wrightson Stewart awarded 'Highly Commended' for La Boite Theatre Pop Up Bar at the 2013 IDEA Awards. Wrightson Stewart was awarded a 'Highly Commended' for our project La Boite Theatre Pop Up Bar at the recent 2013 IDEA Awards. We feel very privileged to have received this award, along with being shortlisted in 3 other categories, including 2013 Designer of the Year. It was an honour to be shortlisted, accompanied by such inspiring competition. Wrightson Stewart is an innovative Brisbane-based consultancy, specialising in quality residential and commercial interior design. Under the design direction of Ian Wrightson and Steven Stewart, Wrightson Stewart draws on the knowlege and experience developed over the last ten years of practise.